By Nicholas Galea, a criminal defense attorney in Rockford, Illinois and a 2013 graduate of the University of Illinois College of Law. You can follow him on Twitter at @invertedWAR. 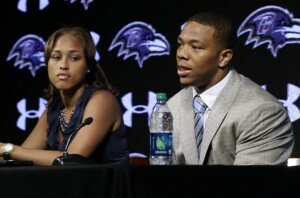 Ray Rice and wife Janay Palmer (left) now find themselves at the center of the nation's attention due to Rice punching out Palmer on video in an Atlantic City casino. When TMZ released the video of Ray Rice battering Janay Palmer in an elevator, it raised more questions than it answered. It has also placed renewed scrutiny on all parties: Rice, Harbaugh, Goodell, and even NJ prosecutors. Questions abound. Why the diversionary program? Why two games? Why the different punishment now? Each facet of the issue touches on a few legal concepts that can be rather confusing, even for seasoned attorneys. So now I’ll try to put my criminal law knowledge to good work and attempt to answer some of the more common questions I’ve seen asked. What’s with the pre-trial diversion program? How could you not prosecute Ray Rice? The idea that Rice was not prosecuted is 100% false. His placement in a diversion program involves a plea of guilt, the attachment of due process, and all of the usual processes of a prosecution. Guilty pleas in exchange for these opportunities are quite common, especially as criminal justice reformers have embraced a softer approach to sentencing in order to disrupt defendants’ lives less and save money on incarceration. Although I am not too familiar with New Jersey’s programs, in Illinois it is common for 1st-time misdemeanor offenders to receive court supervision. This gives the offender a year or two to pay a fine, complete public service work, or comply with any other terms deemed fit. With compliance, the case is considered dismissed, and no conviction is entered. This is advantageous for many reasons. However, the courts always have record of prior court supervision terms. It should be seen less as a gift, but more of a firm message sent by the court that we will give you one opportunity to prove you are better than your criminal action. Ok, but isn’t there a limit to who gets a diversion? Surely, violent offenders shouldn’t get a break! The reasons why Rice was offered this chance are not entirely clear. But generally speaking, prosecutors are expected to offer 1st-time offenders diversion as a matter of course. This expectation diminishes when there are aggravating factors; for domestic violence, that typically involves the use of a weapon, the infliction of great bodily harm, or a particularly vulnerable victim (pregnant woman, minor, etc.). For the most part, these factors are statutory. The criminal justice system tends to move in automation based on where the facts of each case fall within various statutory guidelines. This is both intentional, to avoid treating classes of defendants differently, and unintentional, as courts try to clear out crowded dockets. In Rice’s case, one expects that the prosecutors would see the video and feel that this was a special case. There are a number of potential reasons why they didn’t press for jail time. It’s possible they felt that a trial would be too risky without Janay being willing to testify for the state. They may have simply been too burdened to use valuable trial time on a 1st offender. For all I know, they might not have even watched the video. It’s also possible that Rice got special treatment due to his wealth and celebrity status. I don’t believe that; in my experience, plenty of average defendants and even public defender clients have gotten similar deals in similar cases. The elevator knockout video released by TMZ sank Rice's chances of playing in the NFL this year. Roger Goodell claims he suspended Rice for only two games because he didn’t see the video. Is that true? I highly doubt it. It stretches the bounds of common sense that TMZ could have acquired the video but not the NFL. Because the video was recorded on casino video cameras, they have the right to give copies of it to whomever they choose. At least in Illinois, court rules would have prevented Rice’s attorneys or the prosecution from providing the NFL copies of the video. But could the NFL simply have contacted the hotel and requested (even purchased) the video from them? Absolutely. Can the NFL just increase his suspension like that? Can the Ravens cut him like that? Probably no, and probably yes. Both of those decisions would be subject to the Collective Bargaining Agreement and any other agreements between the NFL and the NFLPA. Most likely, the PA could challenge those decisions with a grievance and seek arbitration on the matter. Arbitration is a quasi-legal proceeding where the arbiters are not specifically required to follow rules of procedure or evidence. However, they typically will use those rules as guidelines, as they are considered “best practices.” In criminal court, the state would not be able to re-try and re-sentence a defendant simply because public outcry had convinced them to do so, and I doubt an arbitrator would allow it either. On the other hand, teams have a general right to release players for any reason. Challenging those actions requires a showing of bad faith on the part of the Ravens, that their reason for the move was false or inappropriate. An arbitrator would probably find that the Ravens had a valid reason to cut Rice simply as a matter of public relations, even if they did take longer than they should have. Isn’t what Rice did worse than Josh Gordon/Michael Vick/Richie Incognito/Plaxico Burress/etc.? Punishments are supposed to be tailored specifically to a case’s individual circumstances. Comparisons between different crimes (and classes of crimes) are nearly impossible. For instance, is abusing a dog worse than abusing a person? That’s a normative question with no objective answer, and it’s further confused by comparing a single act to organized crime.. Gordon’s punishment is severe because of repeat offenses; how does one compare a 1st offense of one crime with a 4th offense of another? It is tempting to use other punishments as measuring sticks to debate whether someone is being treated too harshly or too lightly, but it is a fool’s errand. This entry was posted in Articles, Q & A's and tagged Baltimore Ravens, criminal law, domestic violence, football, NFL, Ray Rice. Bookmark the permalink.